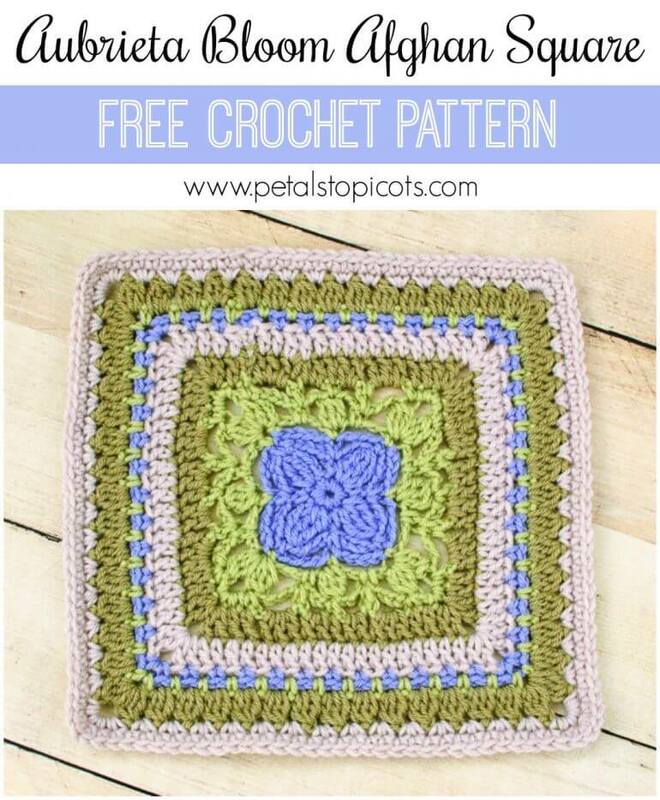 I’ve been wanting to make a garden inspired afghan for awhile now. I was envisioning various floral afghan squares all pieced together. 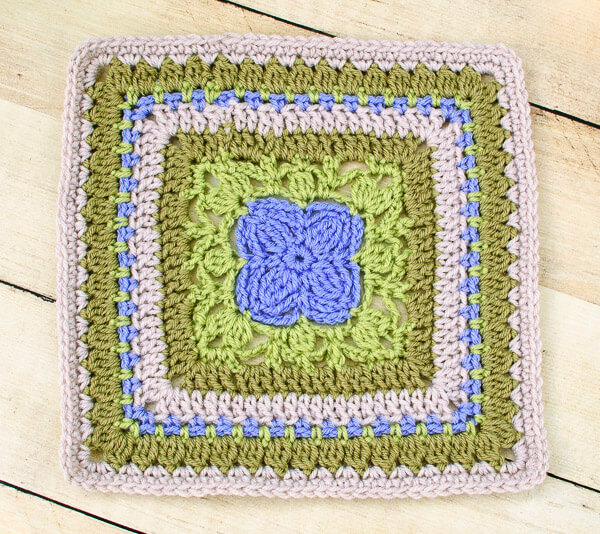 After playing around with some designs, I worked out this Aubrieta Bloom Afghan Square crochet pattern and I’m really loving it! I really hope you guys love it too! 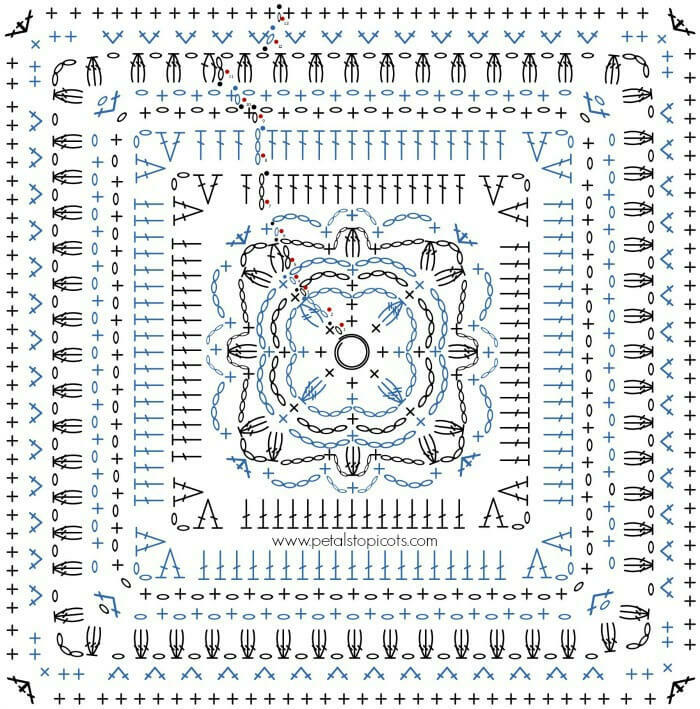 Since the written pattern can be a bit wordy, I also included a stitch diagram of the square for those of you who like to follow along in a more visual way. Enjoy!! 2 double crochet cluster (2dc-cl) – *yarn over and insert hook into stitch, yarn over and pull through stitch, yarn over and pull through 2 loops on hook** (2 loops remaining on hook), working in same stitch repeat from * to ** (3 loops on hook), yarn over and pull through remaining 3 loops on hook. 3 double crochet cluster (3dc-cl) – *yarn over and insert hook into stitch, yarn over and pull through stitch, yarn over and pull through 2 loops on hook** (2 loops remaining on hook), working in same stitch repeat from * to ** (3 loops on hook), working in same stitch repeat from * to ** (4 loops on hook), yarn over and pull through remaining 4 loops on hook. 2 triple crochet cluster (2tr-cl) – *yarn over twice and insert hook into stitch, yarn over and pull through stitch, yarn over and pull through 2 loops on hook, yarn over and pull through 2 loops on hook** (2 loops remaining on hook), working in same stitch repeat from * to ** (3 loops on hook), yarn over and pull through remaining 3 loops on hook. 3 triple crochet cluster (3tr-cl) – *yarn over twice and insert hook into stitch, yarn over and pull through stitch, yarn over and pull through 2 loops on hook, yarn over and pull through 2 loops on hook** (2 loops remaining on hook), working in same stitch repeat from * to ** (3 loops on hook), working in same stitch repeat from * to ** (4 loops on hook), yarn over and pull through remaining 4 loops on hook. Finished square measures approximately 12 in. x 12 in. With CA, make a magic ring (as an alternative to the magic ring, you can ch 4 and join with a slip st in furthest chain from hook to form a ring). Round 1: Ch 1, work 8 sc in ring, join in first sc — 8 sc. Round 2: Ch 3, 2tr-cl in same st as join, ch 4, 1 sc in next, ch 4, *3tr-cl in next st, ch 4, 1 sc in next st, ch 4, repeat from * around, join in the top of first cluster st — 4 sc and 4 cl sts. Round 3: Ch 1, 1 sc in same st as join, ch 4, 1 sc in next sc, ch 4, *1 sc in top of next cluster st, ch 4, 1 sc in next sc, ch 4, repeat from * around, join in first sc — 8 sc. Round 4: Ch 1, 1 sc in same st as join, ch 5, *1 sc in next sc, ch 5, repeat from * around, join in first sc — 8 sc. Round 5: Join CB in same st as join, [ch 2, 2dc-cl, ch 3, 3 dc-cl] in same st as join, ch 4, 1 sc in next ch-5 sp, ch 3, 3dc-cl in next sc, ch 3, 1 sc in next ch-5 sp, ch 4, *[3dc-cl, ch 3, 3 dc-cl] in next sc, ch 4, 1 sc in next ch-5 sp, ch 3, 3dc-cl in next sc, ch 3, 1 sc in next ch-5 sp, ch 4, repeat from * around, join in first cluster st — 12 cluster sts, 8 sc. Round 6: Ch 1, 1 sc in same st as join, 3 sc in next ch-3 sp, 1 sc in next cluster st, ch 4, 1 sc in next sc, ch 3, 1 sc in top of next cluster st, ch 3, 1 sc in next sc, ch 4, *1 sc in top of next cluster st, 3 sc in next ch-3 sp, 1 sc in next cluster st, ch 4, 1 sc in next sc, ch 3, 1 sc in top of next cluster st, ch 3, 1 sc in next sc, ch 4, repeat from * around, join in first sc — 32 sc. Round 7: Join CC in same st as join, ch 3 (counts as dc), 1 dc in next st, [2 dc, ch 2, 2 dc] in next st, 1 dc in each of the next 2 sts, 3 dc in next ch-4 sp, 2 dc in next ch-3 sp, 1 dc in next st, 2 dc in next ch-3 sp, 3 dc in next ch-4 sp, *1 dc in each of the next 2 sts, [2 dc, ch 2, 2 dc] in next st, 1 dc in each of the next 2 sts, 3 dc in next ch-4 sp, 2 dc in next ch- 3 sp, 1 dc in next st, 2 dc in next ch-3 sp, 3 dc in next ch-4 sp, repeat from * around, join in top of beginning ch — 76 dc. Round 8: Join CD in same st as join, ch 3 (counts as dc), *work 1 dc in each st to next corner ch-2 sp, [2 dc, ch 2, 2 dc] in ch-2 sp, repeat from * around, join in top of beginning ch — 92 dc. Round 9: Join CA in same st as join, ch 1, work 1 sc in same st, ch 1, skip next st, *+1 sc in next, ch 1, skip next st, repeat from + to corner ch-2 sp, [1 sc, ch 1, 1 sc] in corner ch-2 sp, ch 1, skip next st, repeat from * around, join in first sc, fasten off CA and weave in ends — 52 sc and 52 ch-1 sp. Round 10: Join CB with a Slip st in next ch-1 sp, ch 1, work 1 sc in same ch-1 sp, ch 1, skip next st, *+1 sc in next ch-1 sp, ch 1, skip next st, repeat from + to corner ch-1 sp, [1 sc, ch 1, 1 sc] in corner ch-1 sp, ch 1, skip next st, repeat from * around, join in first sc, fasten off CB and weave in ends — 56 sc and 56 ch-1 sp. Round 11: Join CC with a Slip st in next ch-1 sp, ch 2, work 2dc-cl in same ch-1 sp, ch 1, skip next st, *3dc-cl in next ch-1 sp, ch 1, skip next st, repeat from * to corner ch-1 sp to [3dc-cl, ch 3, 3dc-cl] in corner ch-1 sp, ch 1, skip next st, repeat from * around, join in first cluster st, fasten off CC and weave in ends — 60 cluster sts and 60 ch sp. Round 12: Join CD in same st as join, ch 1, *work 2 sc in each ch-1 sp to corner, work 5 sc in corner ch-3 sp, repeat from * around, join in first st — 132 sc. Round 13: Ch 1, *work 1 sc in each st to corner, work 3 sc in corner st, repeat from * around, join in first st — 140 sc. Mix and match with my other 12-in. afghan square designs. Beautiful. Thanks for the diagram . 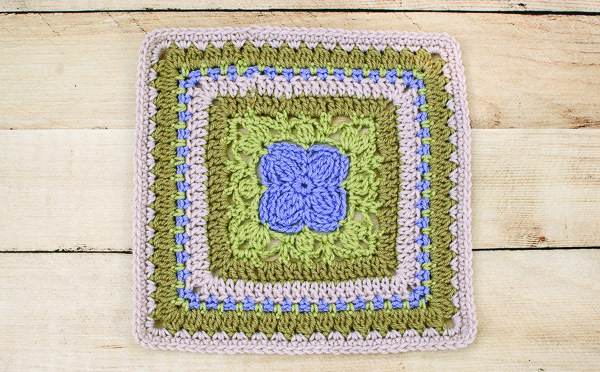 This square is so lovely with the delicate leaf design detailing the brilliant central flower!!! Thank you!!! There are four colors – 2 greens. It’s a beautiful square. I love aubrietia flowers in the spring!